Bush says they believe they know where the gunman was going but won’t say more because it’s an active investigation. Australia’s prime minister says he has asked the Turkish president to withdraw his accusation of an anti-Islam motive behind Australia and New Zealand sending troops to Turkey in the World War I Gallipoli campaign. Australian Prime Minister Scott Morrison said “all options are on the table” if Erdogan does not withdraw his comments. Philip Arps, 44, appeared in a Christchurch court Wednesday on two charges of distributing the killer’s livestream video of last week’s attack on Al Noor mosque, a violation of the country’s objectionable publications law. Each charge carries a maximum sentence of 14 years in prison. New Zealand police have officially released the first names of the 50 people killed in last week’s shootings at two New Zealand mosques. The first funeral for two of 50 victims of last week’s shootings at two mosques in New Zealand has begun. Australia’s Prime Minister Scott Morrison says he will protest to the Turkish ambassador on Wednesday against the Turkish president’s accusation of an anti-Islam motive behind Australia and New Zealand sending troops to Turkey in the World War I Gallipoli campaign. 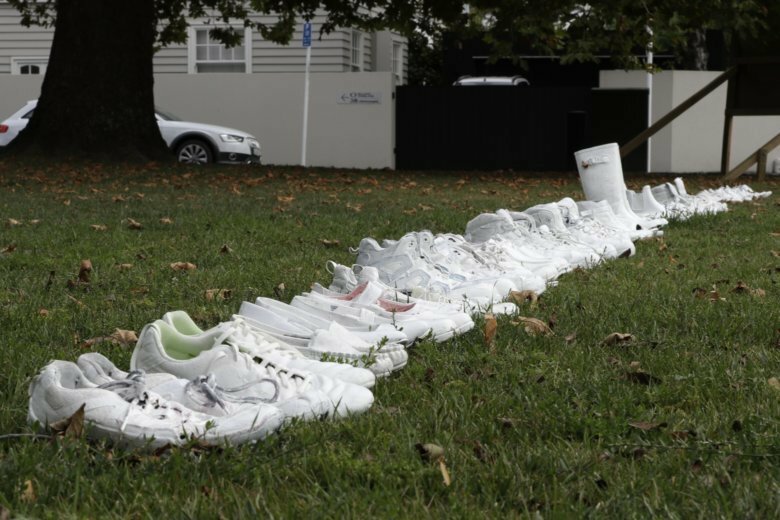 New Zealand Prime Minister Jacinda Ardern has visited a school where two boys killed in last week’s mosque attacks were students. The Cashmere High students killed were 14-year-old Sayyad Milne and 15-year-old Hamza Mustafa. A third Cashmere student, Mustafa’s 13-year-old brother Zaed, is recovering from gunshot wounds to his leg. New Zealand Police Commissioner Mike Bush says police have now formally identified and released the bodies of 21 people out of the 50 who were killed in last week’s mosque attacks. Bush’s comments came after it was announced that the first two burials of the victims are scheduled to take place Wednesday morning. The first two burials of the victims from last week’s mosque shootings in New Zealand are scheduled to take place Wednesday morning. It’s uncertain how many of the victims will be buried there. Officials have received some requests to send bodies to the native countries of those killed. The Global Internet Forum to Counter Terrorism said Monday that it added “digital fingerprints” for the visually distinct videos to its list. Ignoring widespread criticism, Turkey’s president has again shown excerpts of a video taken by the attacker who killed 50 people in mosques in New Zealand. Erdogan has been using clips from Friday’s attack to denounce Islamophobia ahead of March 31 local elections as he tries to stoke nationalist and religious sentiments. Chris Sonderby, vice president and deputy general counsel at Facebook, says “no users reported the video during the live broadcast,” which was viewed fewer than 200 times. Sonderby says in a blog post that Facebook removed the video “within minutes'” of being contacted by police, and it was watched about 4,000 times in total before being taken down. He says Facebook removed 1.5 million videos of the attacks in the 24 hours after the event. Police in New Zealand say they have completed autopsies on all 50 victims of last week’s mosque shootings, and have formally identified 12 of them. Six of the identified victims have been returned to their families.